Drives should always be designed with ample reserve horsepower capacity. Use of overload service factors is important. Belts should be rated at only 1/15th of their respective ultimate strength. 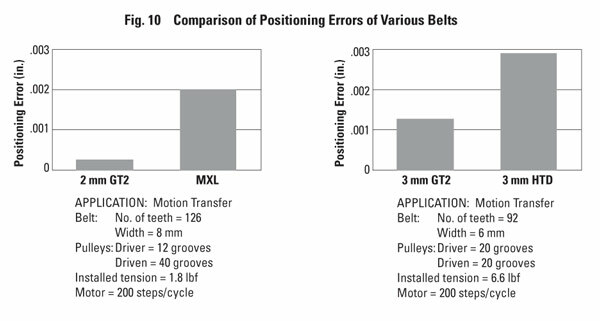 For MXL pitch belts, the smallest recommended pulley will have 10 teeth. For other pitches, Table 8, should be used. The pulley diameter should never be smaller than the width of the belt. Belts with Fibrex-glass fiber tension members should not be subjected to sharp bends or rough handling, since this could cause breakage of the fibers. In order to deliver the rated horsepower, a belt must have six or more teeth in mesh with the grooves of the smaller pulley. The number of teeth in mesh may be obtained by formula given in SECTION 24 TIMING BELT DRIVE SELECTION PROCEDURE. The shear strength of a single tooth is only a fraction of the belt break strength. Because of a slight side thrust of synchronous belts in motion, at least one pulley in the drive must be flanged. When the center distance between the shafts is 8 or more times the diameter of the smaller pulley, or when the drive is operating on vertical shafts, both pulleys should be flanged. Belt surface speed should not exceed 5500 feet per minute (28 m/s) for larger pitch belts and 10000 feet per minute (50 m/s) for minipitch belts. For the HTD belts, a speed of 6500 feet per minute (33 m/s) is permitted, whereas for GT2 belts, the maximum permitted speed is 7500 feet per minute (38 m/s). The maximum allowable operating speed for T series is 4000 feet per minute (20 m/s). Belts are, in general, rated to yield a minimum of 3000 hours of useful life if all instructions are properly followed. Belt drives are inherently efficient. It can be assumed that the efficiency of a synchronous belt drive is greater than 95%. Belt drives are usually a source of noise. The frequency of the noise level increases proportionally with the belt speed. The higher the initial belt tension, the greater the noise level. The belt teeth entering the pulleys at high speed act as a compressor and this creates noise. Some noise is the result of a belt rubbing against the flange, which in turn may be the result of the shafts not being parallel. 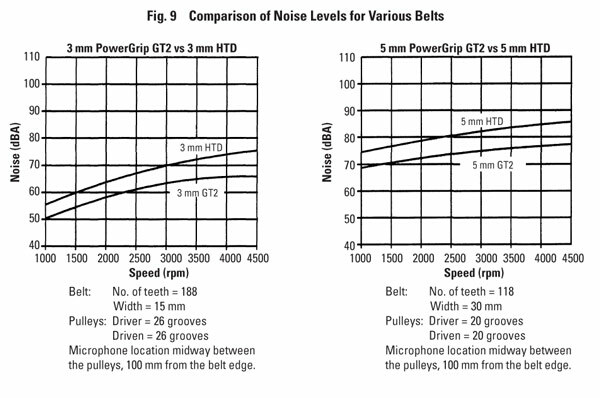 As shown in Figure 9, the noise level is substantially reduced if the PowerGrip GT2 belt is being used. If the drive is part of a sensitive acoustical or electronics sensing or recording device, it is recommended that the back surfaces of the belt be ground to assure absolutely uniform belt thickness. For some applications, no backlash between the driving and the driven shaft is permitted. For these cases, special profile pulleys can be produced without any clearance between the belt tooth and pulley. This may shorten the belt life, but it eliminates backlash. 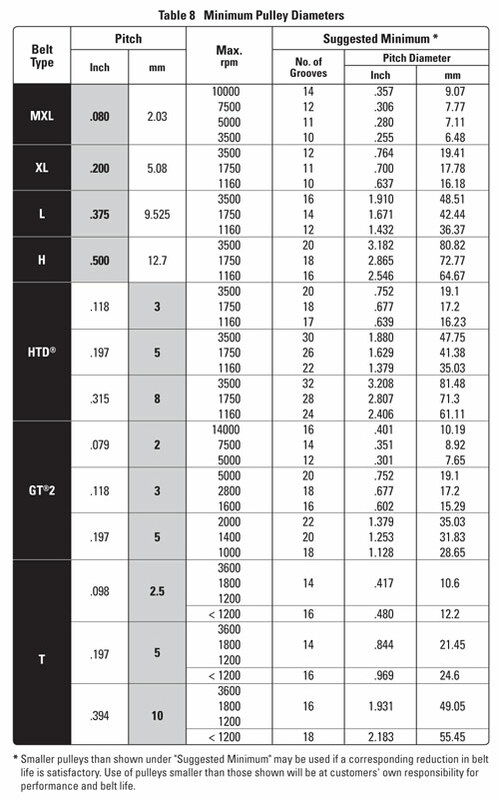 Figure 10 shows the superiority of PowerGrip GT2 profile as far as reduction of backlash is concerned. Synchronous belts are often driven by stepping motors. These drives are subjected to continuous and large accelerations and decelerations. If the belt reinforcing fiber, i.e., tension member, as well as the belt material, have high tensile strength and no elongation, the belt will not be instrumental in absorbing the shock loads. This will result in sheared belt teeth. Therefore, take this into account when the size of the smallest pulley and the materials for the belt and tension member are selected. The choice of the pulley material (metal vs. plastic) is a matter of price, desired precision, inertia, color, magnetic properties and, above all, personal preference based on experiences. Plastic pulleys with metal inserts or metal hubs represent a good compromise. Timing belt installation should be a snug fit, neither too tight nor too loose. The positive grip of the belt eliminates the need for high initial tension. Consequently, a belt, when installed with a snug fit (that is, not too taut) assures longer life, less bearing wear and quieter operation. Preloading (often the cause of premature failure) is not necessary. When torque is unusually high, a loose belt may "jump teeth" on starting. In such a case, the tension should be increased gradually, until satisfactory operation is attained. 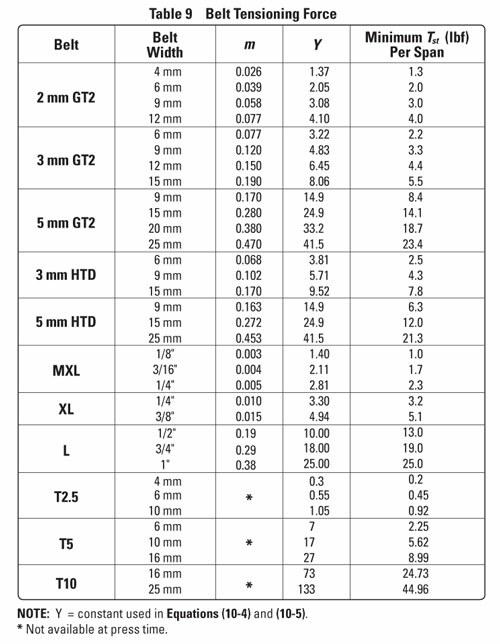 A good rule of thumb for installation tension is as shown in Figure 20, and the corresponding tensioning force is shown in Table 9, both shown in SECTION 10 BELT TENSIONING. For widths other than shown, increase force proportionally to the belt width. Instrumentation for measuring belt tension is available. Consult the product section of this catalog. Be sure that shafts are parallel and pulleys are in alignment. On a long center drive, it is sometimes advisable to offset the driven pulley to compensate for the tendency of the belt to run against one flange. On a long center drive, it is imperative that the belt sag is not large enough to permit teeth on the slack side to engage the teeth on the tight side. It is important that the frame supporting the pulleys be rigid at all times. A nonrigid frame causes variation in center distance and resulting belt slackness. This, in turn, can lead to jumping of teeth – especially under starting load with shaft misalignment. Although belt tension requires little attention after initial installation, provision should be made for some center distance adjustment for ease in installing and removing belts. Do not force belt over flange of pulley. Idlers, either of the inside or outside type, are not recommended and should not be used except for power takeoff or functional use. When an idler is necessary, it should be on the slack side of the belt. Inside idlers must be grooved, unless their diameters are greater than an equivalent 40-groove pulley. Flat idlers must not be crowned (use edge flanges). Idler diameters must exceed the smallest diameter drive pulley. Idler arc of contact should be held to a minimum.